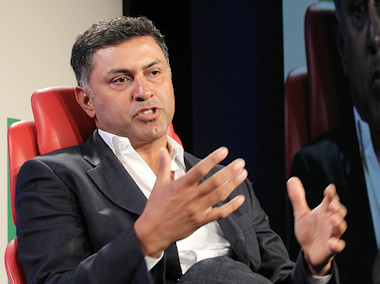 Google’s Nikesh Arora wears a lot of hats at Google. Holding the titles of senior VP and chief business officer, it’s Arora’s job to figure out where and when and how to start making money on the company’s various products. In a wide-ranging interview at our D: Dive Into Media event, Arora talked about everything from the future of online advertising to Google Glass to the company’s internal culture. One of the biggest tipping points in online advertising, Arora said, will be when the majority of televisions are connected to the Internet. “I think the number has stayed pretty consistent,” Arora said. About half comes from Google.com and half from partners. As to where those search queries go, Arora denied the notion that more and more is being steered toward Google sites, saying homegrown sites remain a small, single-digit percentage of results. “I think most of it ends up on other parties’ sites out there, always has,” Arora said.